Mainstream USAF units covered across a number of eras and theaters, from USAFE and PACAF in the 1980’s and 90’s to a present day CONUS based F-16 Wing. Plenty of subjects for everyone, including some unusual F-16s. 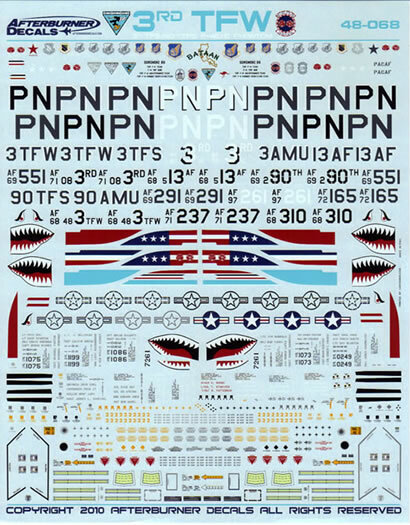 As part of their package of releases that were timed for the IPMS Nationals in the US, Afterburner Decals release four new sheets in their now trademark large format, taking full advantage of the printing skills of Italian firm Cartograf. Whilst one set covered the F-14s of VF-84, the remaining three sets focused on historical and present day USAF subjects. Hidden amongst the gems on these three sheets include US based foreign F-16s, MiG killers, colourful noseart and international zaps. Something to interest every modeler can probably be found amongst the numerous subjects on these three sheets. The first of these new sheets, 48-067 provides markings for F-16s of a wide variety of sub-types as used by the 56th Fighter Wing at Luke AFB in Arizona for the F-16 training mission within Air Education and Training Command. This is not limited to USAF aircrew as pilots from countries including Singapore and Taiwan learn to fly the F-16 at Luke. Listing all the subjects on this sheet would be exhausting however there are a number of highlights among the over 23 options provided by Afterburner. These include F-16DG AF90-0778 significant because whilst deployed on Operation Southern Watch in 2002 employed an AIM-120 AMRAAM to shoot down an Iraqi Air Force MiG-25 Foxbat. This was the first air to air kill for the USAF F-16 fleet and also the first successful kill using the then new AMRAAM missile. Others of interest include two F-16s from the Republic of Singapore Air Force Peace Carvin detachment including an F-16C and F-16D Block 52 with enlarged spine and hybrid USAF/RSAF markings along with one of the unique F-16A Block 20s of the Republic of China (Taiwan) Air Force. All subjects are PW powered subtypes including Block 25 and Block 42 build airframes. This sheet is a blast from the past for Afterburner covering F-4E and G Phantoms from the 3rd TFW during the period it was based at Clark AFB in the Philippines from 1981-1991. 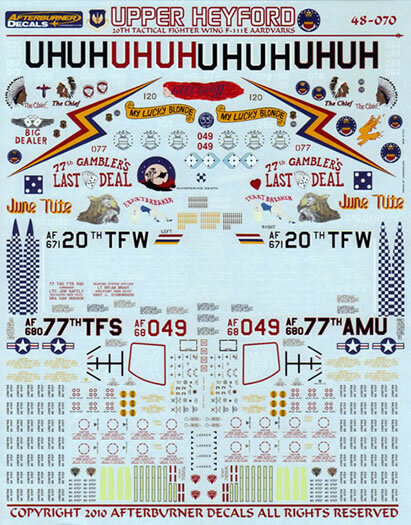 Like all the large format Afterburner sheets this set has a large range of options covering no less than 16 different airframes including two F-4G Wild Weasel aircraft that have MiG kills from their time as F-4Es during the Vietnam War. Around half the subjects are in the later Egypt 1 scheme including many deployed to Incirlik Airbase in Southern Turkey for Operation Desert Storm. The others include subjects in the Euro 1 scheme and three in variations in the South East Asia scheme which is most commonly associated with F-4s. Aside from the MiG Killers, the option that caught my eye unsurprisingly was that which bears a zap from a visiting RAAF unit. The RAAF were regular visitors to Clark AFB for Exercise Cope Thunder throughout the 80’s and what is most surprising is that there are not more examples of 3rd TFW Phantoms that received attention from the marauding Aussies. 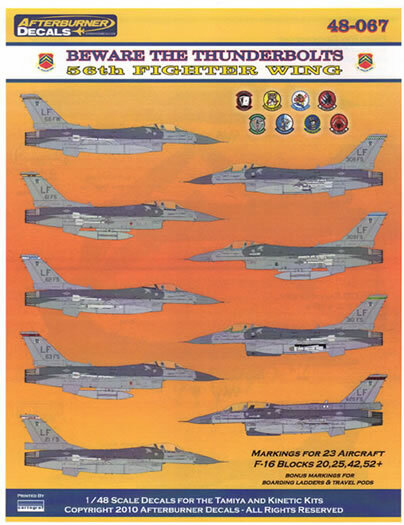 To wrap up this batch of releases is a sheet covering the USAF 20th Fighter Wing in the days before it was the Shaw AFB based F-16 Wing it is today. In this case we are taken back to Great Britain in the period from 1982 to 1993 when the 20th was based assigned to USAFE and based at RAF Upper Heyford. 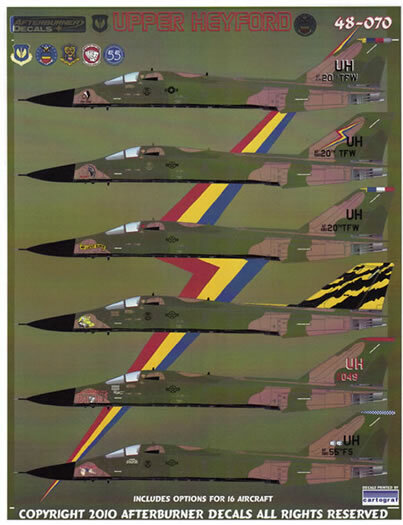 As per 48-068, this sheet includes no less than 16 different F-111Es from the three units that constituted the wing including the 77th, 79th and 55th Fighter Squadrons. Starting with three variations of the 20th FW “Wing King” in 1986, 88 and 1989 options are then provided for flagships and line jets, some of which include spectacular nose art such as the 77th’s retirement scheme “The Gamblers Last Deal” or mission logs from Operation Desert Storm when units from Upper Heyford to Incirlik Airbase in Turkey. As per the period all the subjects are in the South East Asia scheme with black undersurfaces, which was common to both USAF and RAAF F-111s well into the 1990s. To this end Afterburner provides a large clear diagram over two pages to cover this scheme. In summary, the range of subjects provided on these three new sheets from Afterburner are many and varied. In addition many have significant combat histories from recent conflicts, adding to their attraction. In addition to the specific airframe markings including crew names, Afterburner provides stenciling for two complete airframes with each sheet. 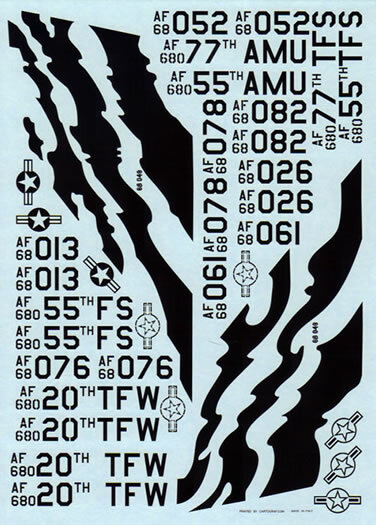 Given the wide range of subjects, these stencils address some of the changes seen on USAF aircraft in the range of schemes depicted, especially with the Phantoms for which three different schemes are depicted. Afterburner always provides detailed instructions as is to be expected. 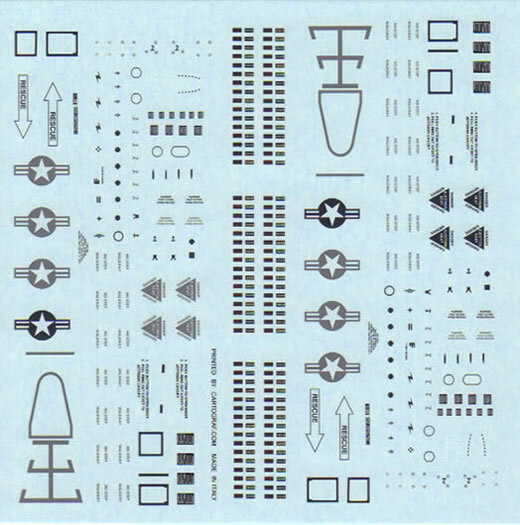 They come printed in full colour across many A4 pages for each set and include stencil placement diagrams and very useful sheets of diagrams and text describing the various small differences applicable to the various F-16 sub-types, F-4s and F-111s. Also included are standard stores configuration diagrams for Operation Desert Storm as applicable to the F-4 and F-111. 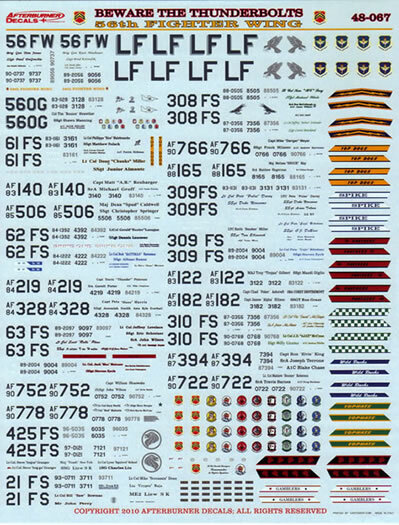 Overall this is a quality set of decals which cover another collection of USAF subjects from the last thirty years. 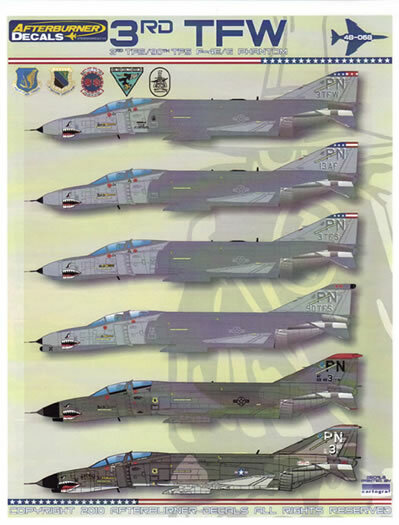 These sheets are yet another tour d’force of USAF History from Afterburner that should inspire any modeler with an interest in the aircraft of the USAF.